Heaps better than OEM and far far better in the wet. The PR4s really do inspire confidence. I have around 12000klms on them and I would think they are good for another 2500 - it's the rear that will go first. I'm nearly at 9000km on the OEM tires. They still look good, although they started squaring off a bit after a recent tour that involved a long highway stint. My biggest gripes with the Scorpion Trails are wet weather handling and dry weather handling when leaned over. In dry weather, I can feel the rear starting to get a bit squirrelly when I am close to the edge. In the wet, this only gets worse. I will get the PR4s put on at about 10,000. I feel like the pirelli scorpion Trails will last another 2000km, but not worth the wait. Well given the bike you ride and what it's designed for....this is just what you don't need! 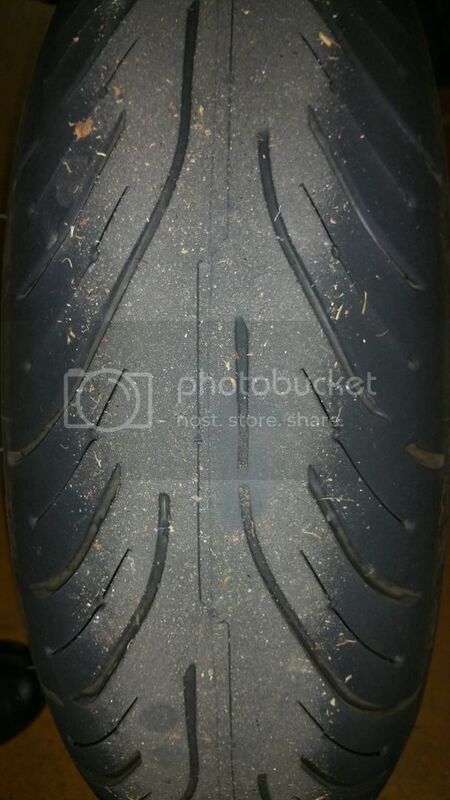 I don't expect great mileage, but the Pirelli Supercorsa SP's have just incredible amounts of grip, also on the edge. Haven't been on the forum in awhile . I have been running Conti TKC 80's and have been happy with them all except the mileage . Only about 3000 miles and about worn out . I see the Pirelli MT60's posted . I ran some of these on a differt bike and the life of them was short . Are there any other Dual Sport options I'm missing ? HELP ! I'm not so sure the MT60s will fit this bike but I have been known to be wrong. Yeah, thought about those, too, but I do a lot of highway miles, as well, so worried about these tires squaring off too quickly due to the softer compound. Might try for the next set. Have you had a chance to compare with any dual compound sport touring tires? The Supercorsa SP's are my first tire change on my HS. I had maybe 40% left on Scorpions, but needed newer treads for track day training. Yes, multi-compound tires make good sense for better longevity, while offering good edge grip. I have used a lot of Michelins over the years, but definitely like these Pirellis a whole lot and will look closely at their other models after I wear these down. My 2013 Street Triple R came with Supercorsa SPs. They are absolutely fantastic. Best tire I've ever used for performance. I replaced them with Q3s because Q3s were cheaper, on sale, and Dunlop was offering a $50 gift card. It was just too good to pass up. I didn't like them quite as well as the Supercorsas, but I liked them enough to justify the savings I received. When my Scorpions go I intend to try to Angel GTs. I ride aggressively but safely. I don't intend to go off road or do any track days on the HS so I think the Angel GTs make the most sense. Well, we had great weather here in East Australia this weekend and I've been out on the Hyper....clocked up near 800klms in two days. Now the Road Pilot 4s are down to the tread limits after 14394 klms They are a far better tyre than the OEMs and they have done more distance for the same price (OEMs were at the tread markers at 9348 klms.